Since the passage of the 1790 Naturalization Act that stipulated “all white male inhabitants” could qualify for U.S. citizenship, the category of whiteness has been used in various ways, through laws and cultural norms, to shape U.S. immigration policy. Many of the major debates around immigrants in the 19th and early 20th centuries made distinctions between northern European protestant immigrants — people deemed purely Nordic or Anglo-Saxon — and those from Catholic and other backgrounds, most notably Irish and German Catholics — who were deemed suspect. Nativist movements including the 19th-century Know-Nothing Party and the early-20th-century KKK fomented suspicion of Catholic communities. The 1882 Immigration Act added a head tax on immigrants at U.S. ports and allowed immigration officials to bar entry to criminals, the insane, or “any person unable to take care of him or herself.” These vague restrictions allowed those of racial backgrounds deemed undesirable, including Southern and Eastern Europeans, to be easily excluded. The same year the Chinese Exclusion act banned all immigration from China. The Naturalization Act of 1906 only allowed white persons or those of African descent to be eligible to apply for U.S. Citizenship, while the Immigration Act of 1917, also known as the Asiatic Barred Zone Act, prevented immigration from British India to the U.S. In 1922 Japanese immigrant Takao Ozawa unsuccessful sued the U.S. qualify for citizenship because he claimed that Japanese should be classified as white. He lost the case, cementing the widely held classification that only Caucasians could qualify as white. The same year, the court case United States v. Bhagat Singh Thind classified South Asian Indians (who were technically Caucasian) as Asian, stripping many of their U.S. citizenship. 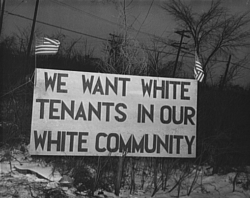 Racial barriers to immigration were finally removed the McCarran-Walter Act in 1952, although white racial preferences remained until the passage of the 1965 Immigration and Nationality Act. Ironically, the Act’s backers claimed that its preference for family reunification would favor white immigrants. In practice, the those who utilized the family reunification portion of the law were overwhelmingly nonwhite.